Religion in its many forms in India and Nepal. An omniscient vibration resonates throughout the compound followed by the opening verse of the Quran. The Niazi Nizami Brothers of Dargah Nizamuddin have settled before the shrine of Hazrat Nizamuddin Auliyah for their weekly prayer ceremony. Their family, cousins, uncles, grandfathers alike, have prayed by singing qawwalis before the saint’s tomb for over eight-hundred years. I was there with the intent to not only pray with them but also photograph them and their practices. After an hour or so, when the prayer had come to an end, I spent some time with a couple of the brothers. We walked to one of the many tea stalls outside the compound where we discussed everything from Rumi to gender in Sufi poetry. Most importantly, however, I was there to see how they view their god. We construct narratives around what we want our god to be, and that says more about us than anything else. 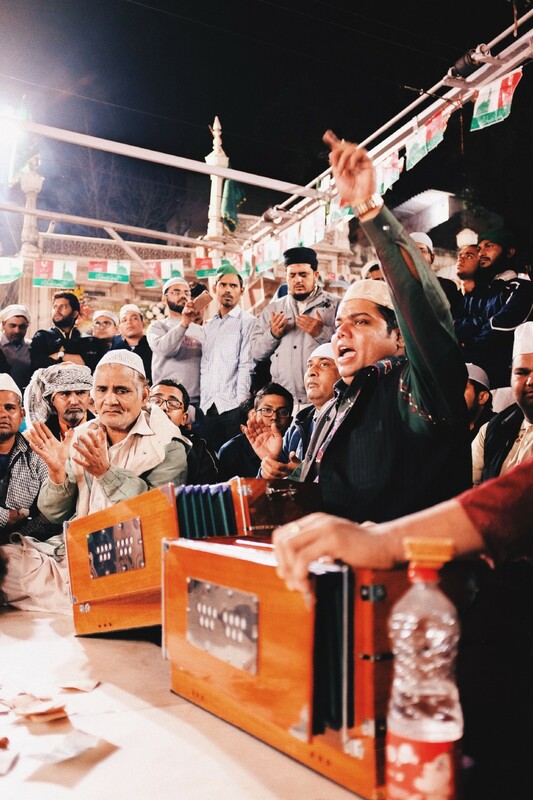 Members of the Niazi Nizami Brothers engage in a session of qawwali as a man in the background prays to the patron saint at Nizamuddin Auliyah Dargah in Old Delhi. I learned early on that god comes in many different forms. In my Hindu home, god was an enormous blue man with multiple arms, brandishing swords, conch shells, and weapons. Wrapped in tiger skin with a snake around his neck. Shiva was my introduction to god and I grew to love him. Yet, over time, I learned of many others that exist — some within the Hindu canon, some in the stories that my mother told me, and others in the books I read. I began to ask myself and others “What is god?” A deity in the sky that we have never seen? Or maybe it’s the love we share with those around us? Perhaps, god is the love we have for ourselves. The gentle care and love that one can show toward themselves which emanates and can be contagious. Perhaps that is god. A Qawwali party sits before Hazrat Nizammuddin Auliyah’s shrine in Delhi. The group congregates on Thursdays to sing in worship throughout the year (save for Ramadan and Muharram). There are sites for pilgrimages throughout this world, some born of superstition and of history. I have traveled to various religious sites like the Vatican, the coast of the Ganges in Varanasi, Konya — where Maulana Rumi rests — and of course, the shrine of Hazrat Nizamuddin Auliyah in Delhi. In these places I saw many who found their god in the statues as the loud speakers called everyone to prayer. Yet, there was a drive within each that led them to bow and pray before someone they look to for answers. There is a beauty in that. To see individuals, reach out to their god; to look within themselves and call out to a god they might adore, fear, or respect. This relationship was there when I witnessed silent men, quietly invested in readings of the Quran. It was also found in a group of musicians singing in favor of Hazrat Nizammuddin, interlacing couplets filled with love directed at the Prophet (PBUH). For hours on end, these men sit before their saint’s shrine and sing. Some in the audience weep as they pray to their god, others dance and lose themselves in ecstasy. These chants and motions are love. Some have found themselves speaking to a statue and others to shrines. A relationship with a god is a complicated one which serves many functions and comes in many forms. Here, no doctrine or dogma decides who is god or what form this god takes. This god is found in a form that is personal to the one who is worshiping. 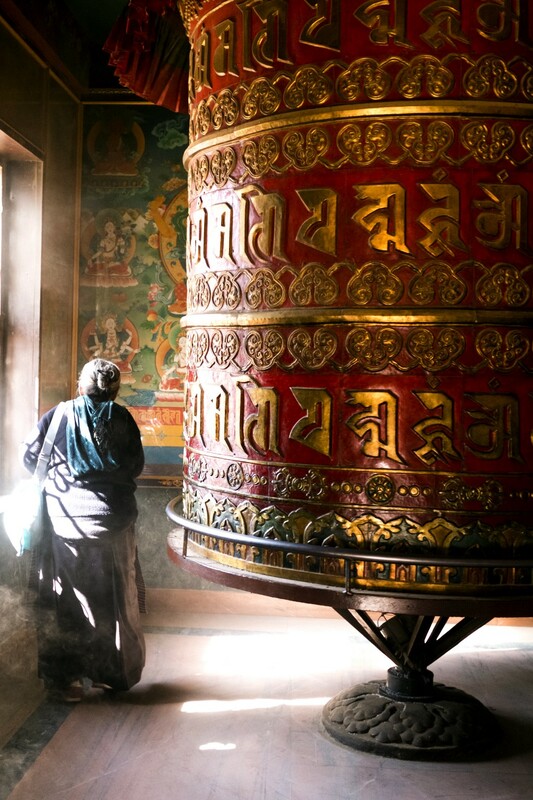 An old woman prays at the Boudhanath Stupa in Kathmandu, Nepal. Often times we ask where the good has gone from the world. It is still there, quietly coming along. This god might not be what you’re taught from a young age, but if there is anything I have learned in classes, books, and introspection, it is that God is what you want it to be. To Rumi, a form of god came forth in the form of Shams Tabriz. To Nusrat Fateh Ali Khan, in the form of poetry for the beloved. To me, in the beauty of poetry and witnessing love and care for others. It is a beautiful thing to see people fall to their knees in worship out of gratitude or despair. They are praying to their god, whatever form it may be in. There was a path that led them to believe in that god and that words they speak, the thoughts they have, are their correspondence with a being that heals them. 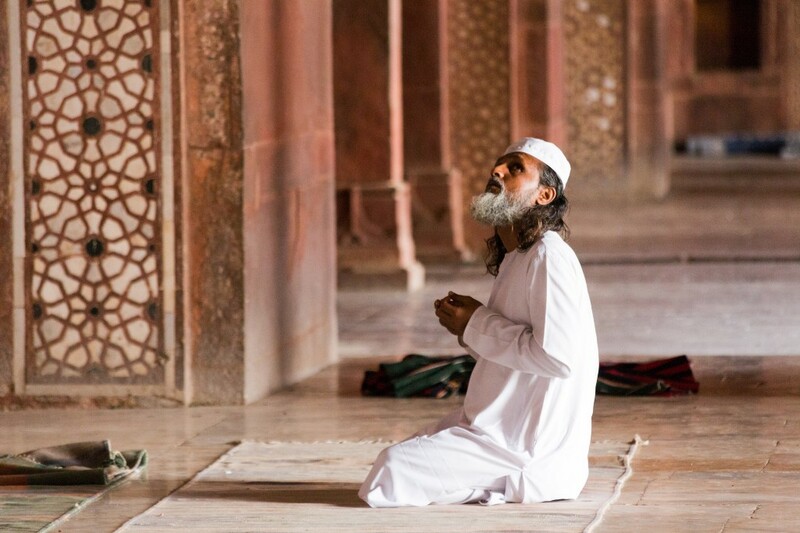 A man prays, looking up toward the heavens in Fatehpur-Sikhri, outside of Agra, India.